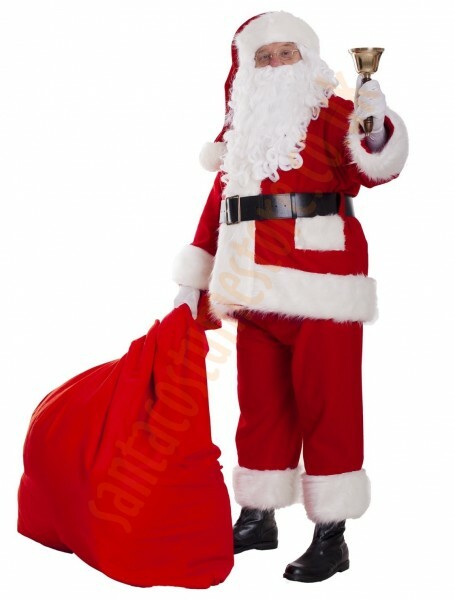 This SUPER DELUXE version of the Santa suit with jacket is the perfect choice for professionals. Durable red fleece, the best faux fur and a long beard; those are but a few of this exceptional set’s features. This Santa suit set contains 11 parts. 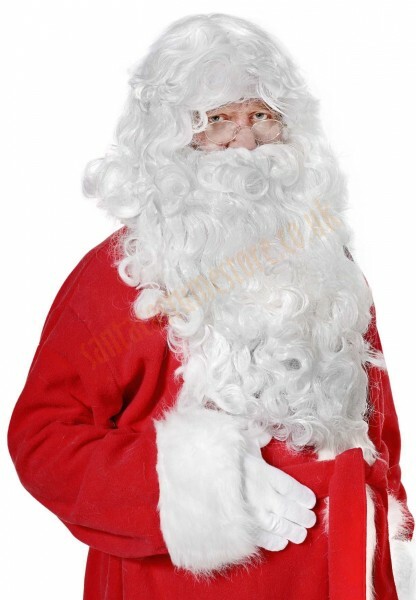 The Super deluxe version of the Santa costume – why is it worth having? 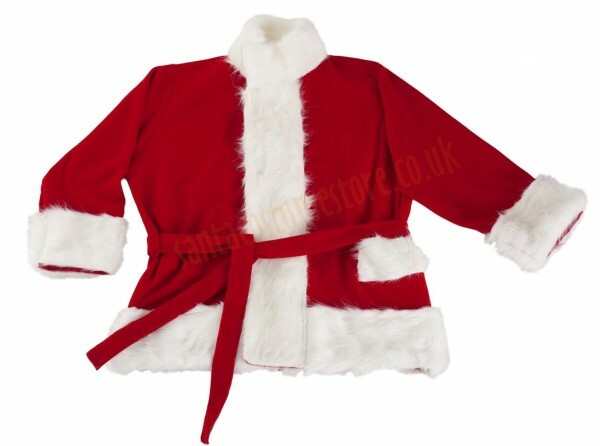 The Super deluxe professional Santa suit is made of top quality deep red fleece, and trimmed with exceptional warm white (ecru) faux fur (2"/4.5 cm pile). This band of fur is even wider than that on the deluxe suit, measuring as much as 5" (13 cm) across! The trousers have two side pockets and the fur can be detached, making it easy for the trouser legs to be tucked inside tall boots. The hat that comes with this set is unlike that in any other version, exclusive to the super deluxe model – extra-long and sporting a very large pompon. This is the option for the most demanding of Santas – for those intending to make a lasting impression on everyone! An extra-long beard (15.5"/40 cm in length) comes as standard with the Super Deluxe sets, together with artificial leather boots trimmed with ecru faux fur. The suit is available in the following sizes: M (5'3"-5'8"/160-174 cm), L (5'9"-6'3"/175-190 cm) and XL (6'3"-6'7"/191-200 cm); for details, see the Measurements chart. What does the set with the super deluxe version of the Santa costume contain? 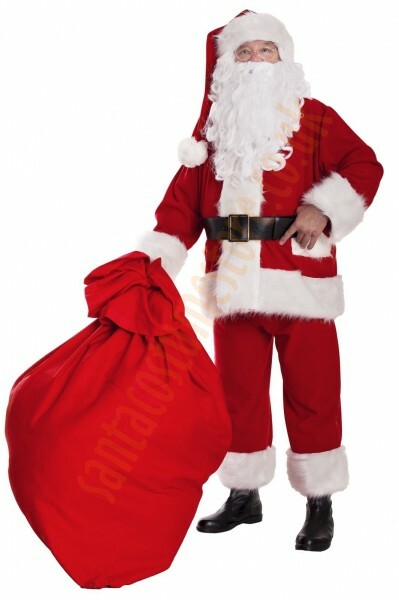 The set contains: professional Santa outfit in super deluxe version (jacket, trousers and hat); long beard with wig; broad belt with a metal buckle; artificial leather boots; Santa belly; neutral-lens glasses + case; and a large sack for the presents (43.5" x 55"/110 x 140 cm). 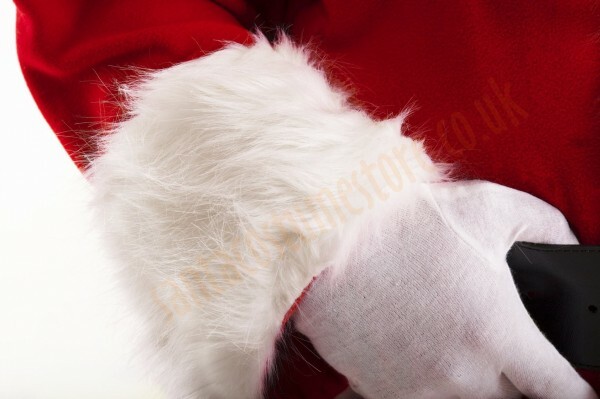 Santa’s jacket fastens with a zip, two (very strong) Velcro patches, and a belt. The pocket on the outside is perfect for keeping the odd treat or two handy (for example sweets for kids). 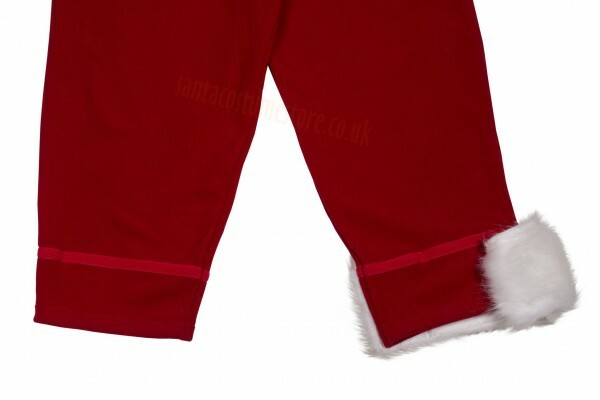 Santa Claus’s trousers feature two side pockets, and since they are elasticated at the waist they suit all figures. The band of faux fur is detachable (held in place with strong Velcro patches), which means the legs can easily be tucked inside tall boots. The hat is topped with a fluffy 5" (13 cm) diameter pompon. This special and unique hat, only available in the super deluxe costume sets, is very long (nightcap style) and gives Father Christmas that little extra fairy-tale magic. 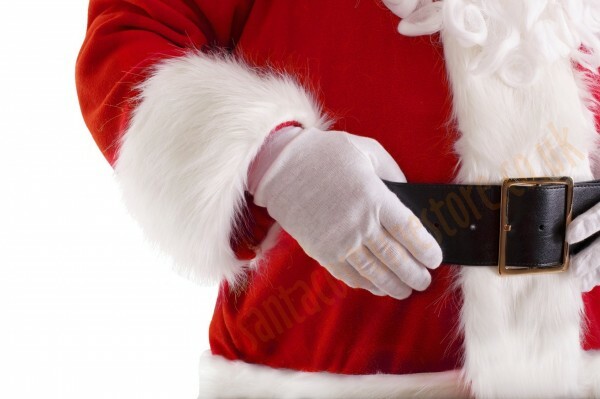 The black belt is great for highlighting the professional Santa costume. 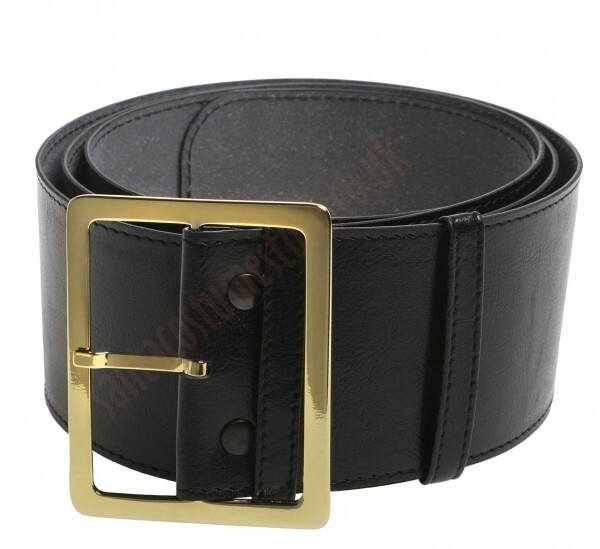 Whereas the ordinary fleece belt may come undone at any moment, this reliable leather belt will make sure no such unexpected surprises test your nerve. 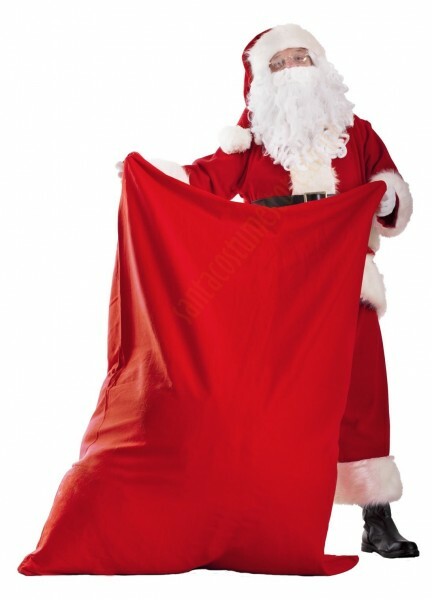 Perfectly designed for the size of Santa’s belly – whether real or artificial – the belt is 65" (165 cm) in length, and thanks to its 26 holes and two belt loops can be adjusted to suit. 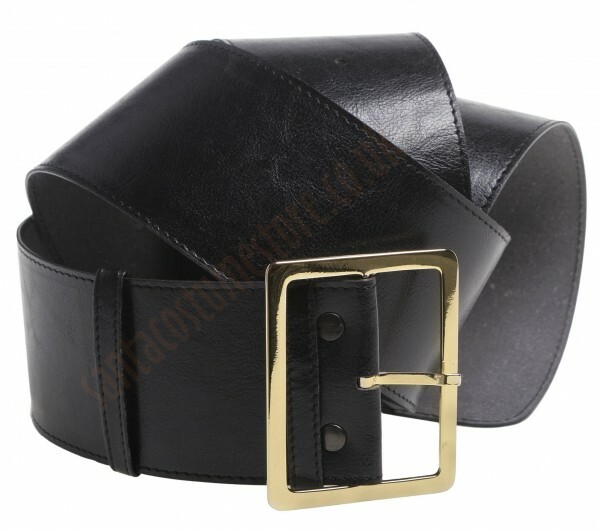 Made of artificial leather, with an additional textile insert reinforcing it, the belt is 3" (7 cm) wide and boasts a large buckle, 3.5" (9 cm) across, in a light-gold colour. With such a belt Father Christmas will make quite an impression! 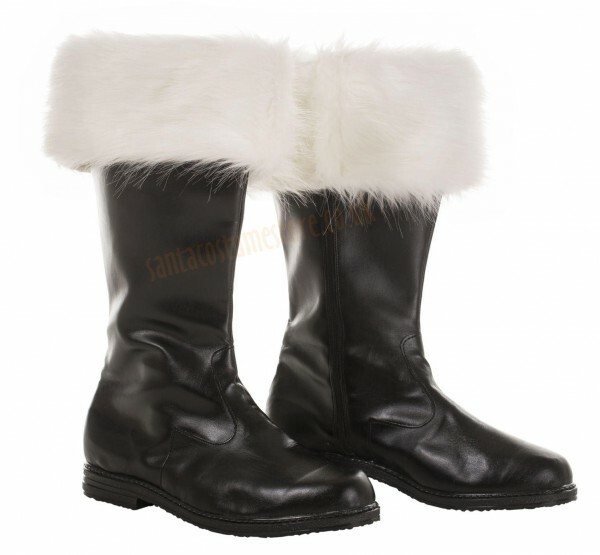 Our durable Santa boots, made of black artificial leather and featuring a smart band of ecru faux fur, are the perfect match for the super deluxe version of the Santa Claus costume (real leather luxury Santa boots, or cheaper velour boot covers, are also available as options). 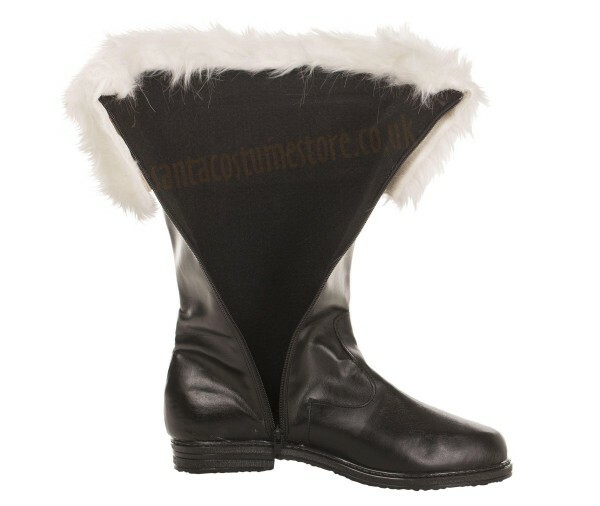 These very comfortable and tough Santa boots will prove particularly useful if the wearer intends to use them outside as well – and thanks to their thick soles you can be sure that Father Christmas won’t freeze, while his costume will remain dry and clean. 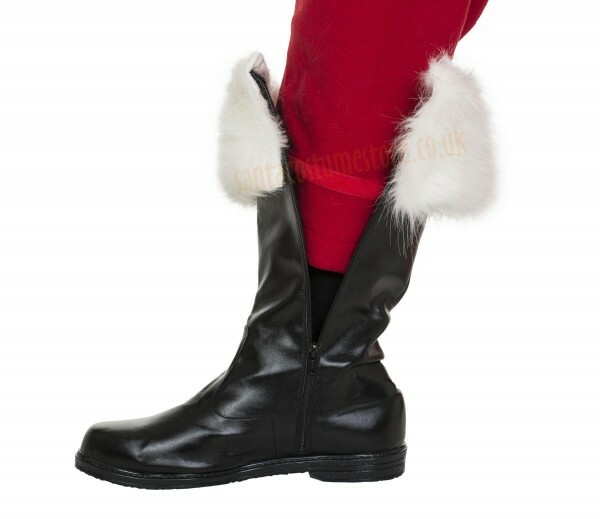 At 14" (35.5 cm) tall, the boots feature zips along their entire length – making it particular easy to put them on and to tuck in Santa’s trouser legs. They come fitted with a smart band of faux fur (2"/4.5 cm pile), fastened with Velcro patches at the zip. With these boots, the entire Santa Claus outfit looks fantastic! 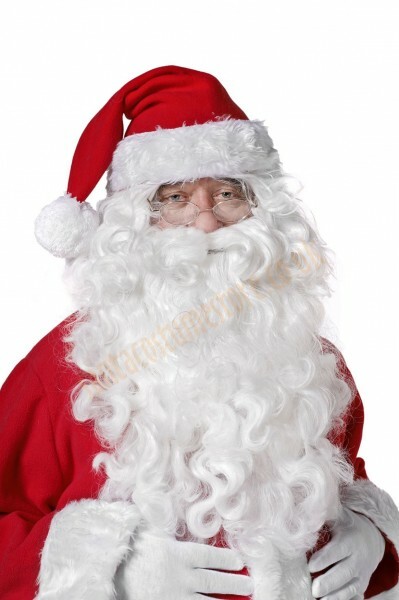 The thick and long Santa beard comes with a moustache and wig, as well as self-adhesive eyebrows. 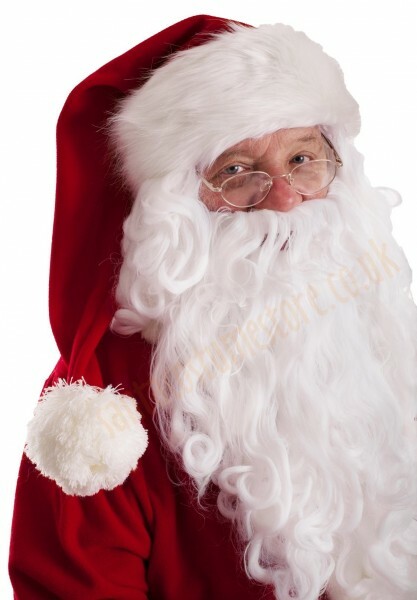 The beard is 15.5" (40 cm) in length (other beards are available under Sizes and options), its hair gently waved, while its warm white colour is the same as that of the faux fur in the super deluxe Santa costume; the generous moustache completes the set. Two elastic straps hold the beard in place, and for that extra certainly you can also use special beard glue. 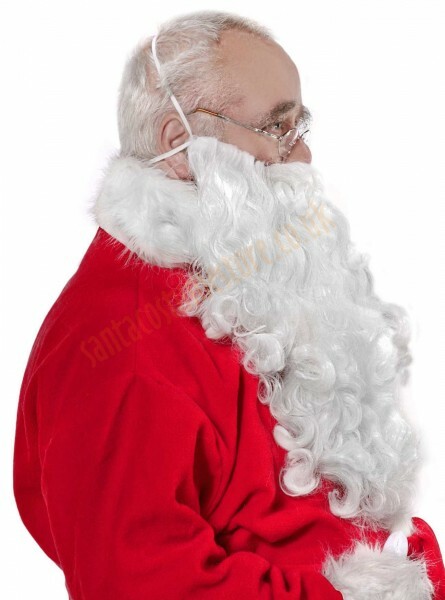 The wig reaches down to the wearer’s shoulders, reliably covering Santa’s own hair, ears and the beard’s elastic straps, all going to ensure that Father Christmas keeps his real identity a secret. The self-adhesive eyebrows complete the wearer’s transformation. The well-matched Santa glasses add dignity to the character, and make the wearer’s identification more difficult. 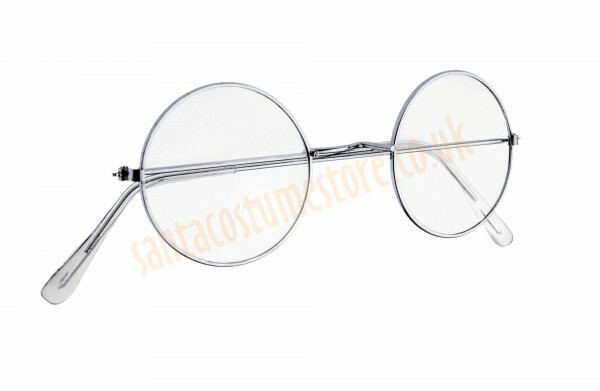 The glasses feature metal frames and neutral lenses (which can be replaced with corrective lenses). 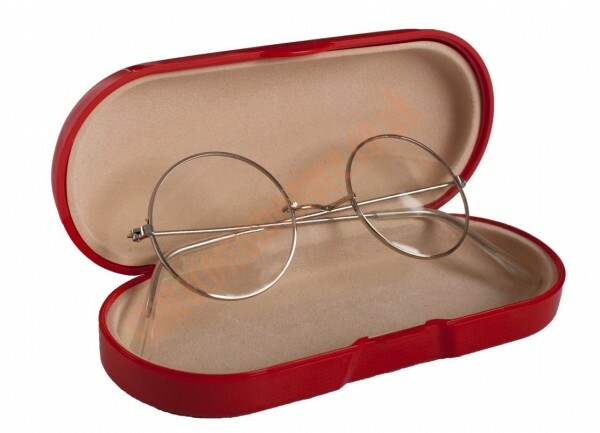 In addition the glasses come with a stiff protective case to make sure they last. The appearance of the case may differ somewhat from that in the photograph, but the case will definitely be rigid and lined on the inside. 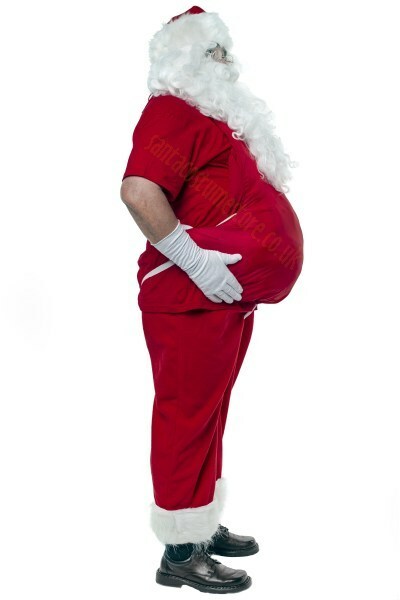 The artificial belly is for those who tend to watch their figure and who would otherwise come across as somewhat too slim for a Father Christmas. 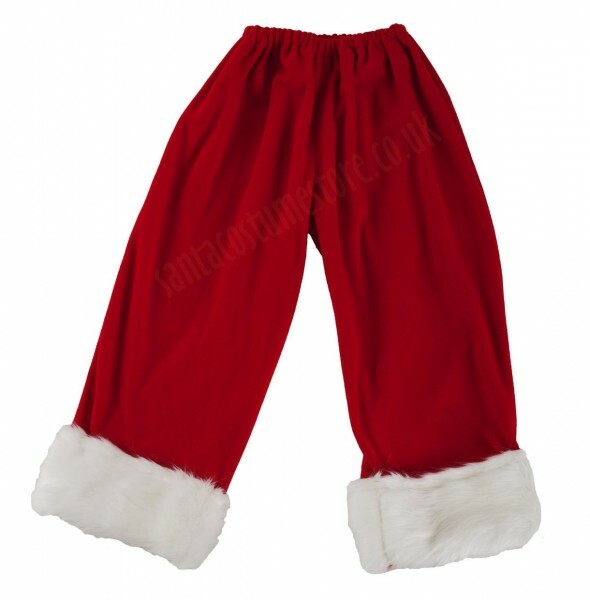 Tied at the neck and with a buckle at the waist plus elastic straps for the legs, the belly is easy to put on and it takes barely a moment to take on Santa’s stately posture. 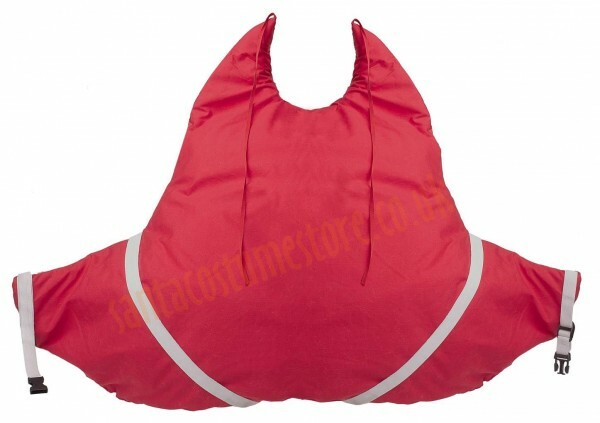 Because it is highly adjustable, the belly can fit any figure. And its breathable cotton on the side worn against the wearer means that it won’t make Santa Claus sweat. Perfect for completing our professional Santa outfit. But even a beautiful Santa suit is not going to delight the children if he arrives without a sack full of Christmas presents! 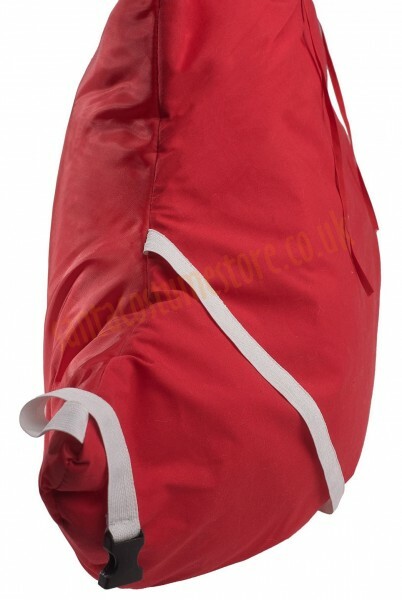 Our large red denim-canvas sack, measuring 43.5" x 55" (1.1 x 1.4 m), is very tough and can hold a mountain of them. Thanks to the double-stitched seam there’s no chance of the sack splitting. And you can also leave your worries aside when putting small gifts into the sack, as the drawstring makes sure that nothing falls out. 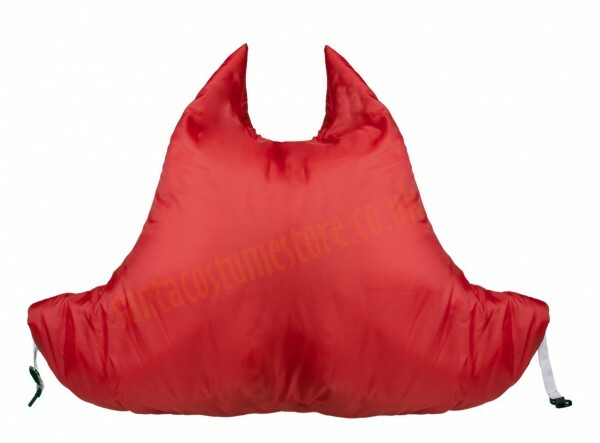 If your sack happens to get dirty, just turn it inside out – and there you have an emergency sack! So Father Christmas, you have nothing to worry about. 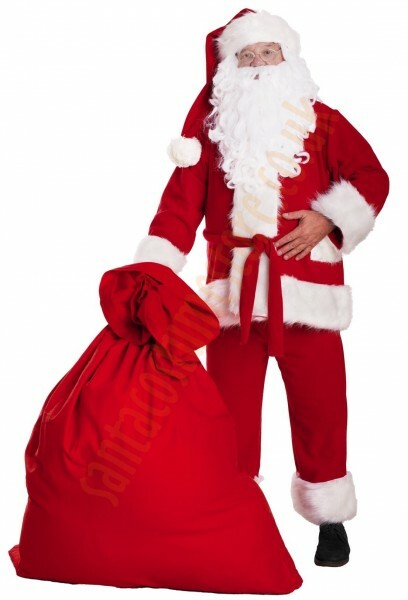 The Super deluxe Santa Suit – the option for professionals! NB: this set does not include the gloves and the T-shirt shown in the photos (they may be bought separately).